Graeme McDowell's unshakeable belief in the imminent upturn in his game was proved correct in Los Angeles last night when he brilliantly engineered a five-under 66 to claim a share of the clubhouse lead in the Genesis Open. The Portrush man (38) might be 219th in the world and winless since late 2015 but he played like the US Open champion of old at Riviera Country Club. Not only did he drive the ball straighter than everyone else or hole putts from every range, he also hit more greens than anyone bar Patrick Cantlay, who shared the clubhouse lead with him on seven-under-par when play was suspended for darkness, one clear of Ryan Moore. Elsewhere, Tiger Woods went back to his Florida drawing board to sort out his driving before next week's Honda Classic, certain to miss the projected two-over cut by four shots after a 76. Woods saw the face of the modern game up close as Rory McIlroy brushed off two more short misses with the putter mid-round to share 15th after a frequently impressive 69. His other young playing partner, US PGA champion and FedExCup holder Justin Thomas also impressed frequently, shrugging off three late bogeys by making an 18 footer at the 18th to join McIlroy on two-under. Pádraig Harrington also showed all his old fighting spirit, grinding out nine closing pars on the front nine to make the cut on the number after a 73 as Shane Lowry failed to spark at all, shooting an untidy 76 before making tracks for West Palm Beach and home. It's not that he was talking up his chances of a first PGA Tour win since the OHL Classic at Mayakoba in late 2015, but he knows that this was a huge step in his bid to regain some much-needed confidence. "Sometimes it's hard to keep kidding yourself and say, 'I'm happy with the process'," McDowell told Sky Sports. "Even though you open up the year with a few missed cuts, the progress has been there the last six months. "I managed to play well a couple of times towards the end of last year but you need rounds like these last two days, in this environment to give yourself the confidence to keep moving forward. I will just try to stay patient this weekend and play as carefree as I can." Starting on the back nine, he opened with three straight birdies, holing a nine-footer at the 10th and two-putting from 13 feet after two superb shots to the 11th before making a nine-footer at the 12th. He was just two shots behind early clubhouse leader Cantlay, who'd fired a 69 to lead by two from Tony Finau on seven-under-par. But while he dropped shots back-to-back, three-putting both the 13th and 14th on those slick Riviera greens, he made three birdies in four holes, picking up shots at the 17th, first and second, to right the ship. The six-footer he holed for birdie at the par-five 17th was arguably his key shot of the day. "I'd hit two great shots in there and then left the putt six feet short," he said. "That was a massive putt at the time because it really kept my momentum going after three-putts at the 13th and 14th had derailed me a little bit." With his confidence restored, he allowed himself a little fist pump when he holed a monster, 54-footer from just off the green at the 240-yard fourth for a birdie two to join the lead. "That was a Brucie bonus," he said. Tough courses suit McDowell, especially when great length is not as big an advantage as it is at other venues. After all, he won a US Open on Pebble Beach's similarly firm and fast poa annua greens in 2010. "I play well on tough layouts," he conceded. "As we touched on yesterday, this course is showing its major quality the last couple of days. The fairways are very soft and the fringes are very soft, so if you pitch it short it kills and if you hit the ball long, it tends to release away. "So when you get out of position on this golf course you have to respect it and try to get back on the right side of holes. I really hit a lot of fairways the last two days so if I can continue to do that, I think the golf course offers up a lot of opportunities. "I have to just try to go out there this weekend and try to stay patient. I am excited to be at the business end and to put some more confidence into the tank." If McDowell was brilliant from the tee to green, Woods was well below par, hitting just five fairways and only nine greens. There was much to admire too but he's too rusty to be competitive at this level just yet and may still be well undercooked come the Masters if he does not play more often. 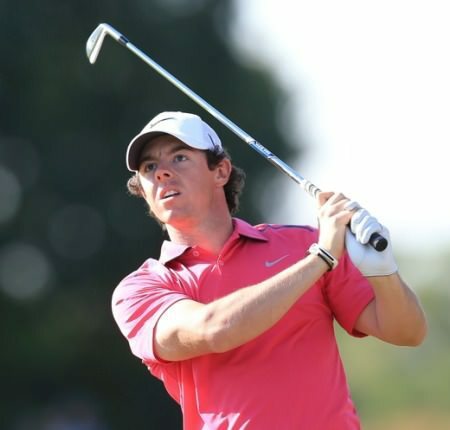 As for McIlroy, he birdied the first and third, then made a 10 footer for par at the fourth before missing two putts inside four feet at the 13th, where he had putted wide from just off the green, and the 14th, where he three-putted from 20 feet. That was partly down to another average wedge shot from 91 yards. He is 100th for proximity to the hole from 50 to 125 yards — Lowry was 149th — but he made up for a few loose wedges with many moments of brilliance. Barring a loose iron shot to the 12th that led to a bogey soft, he did little wrong on the back nine, chipping close to birdie the 11th before converting from 11 feet and 15 feet for birdies at the 13th and 15th. After breaking his driver two weeks ago, Lowry struggled off the tee, hit just seven greens, opening with a birdie at the 10th before immediately making five bogeys in a row to seal his fate. Late in the day, Sam Saunders joined McDowell and Cantlay on seven-under, moving to three-under for his round with three holes to play when play was suspended. A former world amateur No 1 and graduate of nearby UCLA, Cantlay (25) used his intimate knowledge of Riviera to shoot 69 and claim the clubhouse lead on seven-under-par. The Angeleno contemplated a career outside the game when a stress fracture in his lower back showed no sign of healing and he saw his caddie and friend, Chris Roth, killed by a hit-and-run driver in front of his eyes two years ago. “It still bothers me every day. It changes the way that you see things for a while," Cantlay, a PGA Tour-winner earlier this season, said earlier this month. "Maybe not forever, you get numb to it. For a while, I couldn’t care less about everything." His maiden win in the Shriners Hospitals for Children Open in last Vegas last November confirmed him as a future superstar. But with McDowell seeking a solid four-round performance, Finau in control, a resurgent Bubba Watson only three behind, McIlroy and Thomas lurking just five back and Spieth hovering on one-under, he's in for a tough weekend. World No 1 Dustin Johnson is also there, albeit eight shots behind but well capable of a nine or 10-under par weekend.